Kell Osborne (Born in 1939 on the 12th March) was raised by his deeply religious stepfather since the age of two and he wanted Kell to become a minister of the church, something Kell had set his sights on until he came across secular music. Kell had to make a decision to either go into the church or sing, luckily for us he chose the latter but it was something he had to keep from his stepfather and one of the reasons that eventually led to his decision to leave Birmingham as he couldn’t possibly sing the music he wanted to sing there with his step father in the background. Around 1955, four childhood friends, Kell Osborne, Paul Williams, Eddie Kendricks and Willy Waller were an unknown quartet in 10th Grade at Olin High School (later Jackson Olin High after the High School principal) in Birmingham, Alabama, who later trimmed to a trio when Willy Waller dropped out. The trio, like many kids their age had dreams of making it big as singers and Kell upon leaving High School took a job in a local hardware store for six months to save money to get them out of Birmingham, Alabama. Just six months and one day after beginning work at the hardware store, at just 18 years of age and just out of High School, Kell, Paul and Eddie took a Greyhound bus out of Birmingham and headed for Cincinnati. Upon getting off the bus they headed for the King studios but unfortunately for the trio being so early in the day it was closed at the time. It was dark and cold and the three of them deliberated about what to do. They decided that rather than wait for the studios to open they would head onto Cleveland where Willy “Boochie” Waller was now living. Upon arriving in a snowy Cleveland they hooked up again with Willy Waller who put them up at his mother’s house for a few weeks until the trio could sort something out for themselves. Once in Cleveland Kell took a job at the Majestic Hotel washing dishes, Kell later getting Paul a job along side him and Eddie a job as Bellhop/dishwasher as well. The trio also worked the Majestic in the Rose Room as The Cavaliers (after a religious/gospel group). It was here that they would sing to the major acts that played the Hotel, an audition of sorts hoping that they would impress the acts so much that they would get a recommendation to one of the labels of the acts, unfortunately to no avail. They did however get noticed by the local press who ran an article about them dubbing them the Dishwashing Trio. 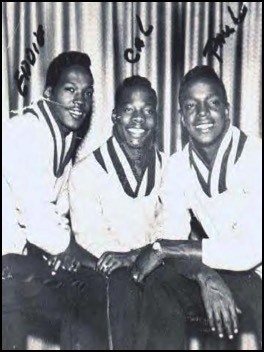 The trio was eventually spotted by a local Pimp by the name of Milton C Jenkins who saw potential in them and he approached Kell, Eddie & Paul, telling the boys how much he liked them and that he wanted to take them under his wing and be their manager! After discussing the offer the three of them decided that they had suffered enough, starving & broke they accepted Milton’s proposal and signed a five year contract with Milton who persuaded them to leave Cleveland for Detroit promising better opportunities in Motor City….he also blessed the trio with a new name, The Primes!!! The name came about after lengthy discussion and was chosen because it meant Number One! Milton also kitted out the trio with clothes and suits to make them look the part as well. Once in Detroit the trio began working the local circuit including the Flame Bar. They rehearsed every day, 12 noon till 3 in the afternoon under instruction from Milton singing music from various genres as he wanted them to be as versatile as possible. Tracks were learnt from various LP’s of the time and some 25 tracks were chosen for the act and rehearsed continuously. One day Milton came round with three girls he had met at the local High School (just what a pimp was doing at a local High School is anyone’s guess), the three girls were Flo Ballad, Mary Wilson and Diana Ross and they wanted Milton to be their manager and so the Primettes were born and became the Primes sister group. The Primettes couldn’t do harmony, well not very well so they were taught harmony, tunes and routines etc by the Kell, Paul & Eddie on a daily basis and this in turn took the natural talent the girls had and improved upon it. Kell remarked that Flo as well as being very beautiful, was also the better singer of the girls. Of course working close together every day there was every chance of them becoming closer on a personal level and Diana Ross became interested in Kell and Mary in Eddie! After some six months in Detroit, rehearsing, doing the local circuit yet getting no where with no recording contract in sight, Kell became disenchanted and disappointed and he decided to leave but he decided he wasn’t just going to up and leave Eddie & Paul. Kell wrote to Mr. Jackson, the trio’s old High School principal, who had been very supportive of the boys, and asked about the chances of putting on a performance at their old High, to which Mr. Jackson agreed and proceeded to set up the arrangements. The trio then headed back to Birmingham and where they did the concert which by all accounts was a huge success. However it wasn’t enough for Kell, he phoned both Eddie & Paul and told them both he was leaving for LA, he wished them both the best for their futures and off he went to, this was the latter part of 1959 according to Kell. What happened to Eddie & Paul is history but it didn’t quite work out that way for Kell. Kell’s first stop was Lester Sill and Lee Hazelwood’s Trey label and a young up and coming producer by the name of Phil Spector. Using a forty piece spiritual voce choir and elements of what later went on to become the wall of sound technique made famous by Phil Spector Kell cut his first solo release, Bells Of St Mary’s b/w That’s Alright Baby. Recorded in Phoenix Arizona, all Kell had to do was lay down his vocals, everything else was all ready done and dusted elsewhere. The record did nothing nationally despite distribution by Atlantic but did hit locally in Baltimore of all places. Bells Of St Mary’s was later recorded by Bobby B Soxx & Blue Jeans (Bobby Sheen). Bobby’s version rocked a little more than Kell’s and was more pop orientated. Kell regrets that the release didn’t hit as he really wanted to sing standards in this vein, the flip the up-tempo rocker That’s Alright Baby wasn’t liked by Kell at all as he didn’t really feel that it was “him”. Something like ten tracks were laid down at the above session, a session Kell went to with Laryngitis upon which Lester Sill gave Kell a bottle of Castrol (must be some 60’s cure for sore throats?) to get him through the session. So there must be some unreleased material tucked away somewhere? Lester Sill thought of Kell as being similar to Jackie Wilson and had big ideas for him but Kell’s impatience got the better of him and not wanting to be another Jackie Wilson but a Kell Osborne he was off to seek pastures greener. Kell was introduced to Leon Rene (Googie’s father) of Class Records but the label unfortunately for Kell was in the process of winding up and Kell just caught the tail end of the labels life releasing two singles, Little Chickadee b/w Do You Mind & with it’s quasi reggae beat Would You Laugh b/w Eye Of The Fire. Operating out of 1489 Vine Street in Hollywood, California the Titanic label would release Quicksand by Kell sometime in 1963. A fabulous beat ballad which would later gain huge popularity in the UK and further afield during the mid 1980s. It’s flip “Lonely Boy Song”, a more uptempo R&B effort would alos gain popularity with dancers a decade or so later. The disc commands a fee of around £300. Next along came what looked like being Kell’s big break, a major in the shape of Capitol where Kell signed a five year contract 1963. But sadly for Kell he was drafted that year and this put an end top any hopers of a future with Capitol. It was while Kell was serving his time in the forces that Billy Revis, Kell’s close friend and personal manager, put out in 1963 Yaya Yaya b/w Something For The Books, thus keeping Kell’s name out there whilst away doing his bit for his country. Yaya Yaya would later be released as the flip to the Highland rarity Law Against A Heartbreaker, although titled Trouble, Trouble Baby. It would appear that whilst in the draft Billy also released Something For The Books b/w Lonely Is The Night on Rayco (1965) (recorded prior to Kell doing his draft circa ’63). This release wasn’t under the name of Kell Osborne but Ozzie Osborne, why Kell hasn’t a clue why Billy Revis changed his name to Ozzie and didn’t really take kindly to this but what could he say? Billy was his closest friend and he was still out there so to speak whilst away in the forces so he couldn’t really complain too much. Kell was backed by Bobby Day (who Kell did regular sessions with when available) and the Hollywood Flames on this release although the Hollywood Flames were anyone who was round Bobby’s place at the time, Kell mentions the likes of the members of the Coasters or Tony Williams of the Platters . After serving his draft, Kell set about trying to establish his career again. 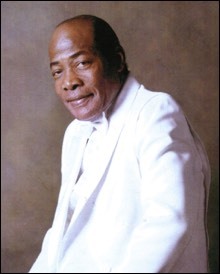 He hung about on a daily basis with close friend Billy Revis who kept Kell working on a regular basis, working with the likes of Eloise Hester who later left to go with Ike and Tina Turner. After Eloise Kell, at the request of Billy Revis hooked up with Rosalind Madison (who was Billy’s wife) working the local circuit. Sometime after his release from the Army Kell would make a solitary release on Glowhill records (9120 S. Western Avenue, Los Angeles). The self penned “That’s What’s Happening” was a duet with a female called Cherry. I asked Kell who Cherry was and he couldn’t remember her name only that she was a girl from an agency. The flip side simply featured the instrumental take of the track. Warner Brothers were looking to get a foot in the thriving R&B scene and this was to be Kell’s next port of call under its Loma subsidiary. Just one release came from this deal, released in November 1965,the up-tempo dancer You Can’t Outsmart A Woman (written by Osborne and Revis) b/w That’s What’s Happening (in the words of Kell, a true story written by himself about married life and what a Guy should do before and after getting married). Again Kell was discouraged waiting for the next release he asked to be released from WB…in the words of Kell “I was always in a hurry, too big a hurry”. Next was a return to a former label or at least a subsidiary. New Bag was a subsidiary of Class Records, owned by Leon René for whom Kell recorded for some years earlier on his Class imprint. Class it would appear ceased to operate the previous year, 1966, New Bag was probably set up as an outlet for Leon’s son “Googie” René . Kell’s contribution to the label was the wonderful “Small Things (Make A Big Difference)” b/w “Nothing From Nothing Leaves Nothing”. A record with a lot going on musically but lyrically it tells the man to look out for the small things in his relationship with his woman, hair, fashion, basically not to forget the small things in a relationship. Never one for staying long in one place, “Small Things” would be Kell’s only contribution to New Bag. He probably realized the label would never amount to much nor attract the distribution Kell sought. From New Bag Kell would move onto Sid Talmedge’s Highland Records in Hollywood. I don’t know why Kell thought he would ever get the fame he sought at Highland as they more often than not leased masters in rather than invested in its artists. It was however a way of keeping Kell’s name out there in the market. At Highland, Kell recorded the extremely rare collectors piece “A Law Against A Heartbreaker”. Sharing the backing of his Loma release “You Can’t Outsmart A Woman”. “Heartbreaker” tells the tale of one man’s woman roaming the streets at night, continually abusing and breaking his heart and how she should be locked up. A release that as far as I am aware never made it to the issue stage of pressing with just a few solitary demonstration/disc jockey copies known, expect to pay something like £5000 for a copy if one was to ever come to market. Many labels were interested in Kell but his close friendship with Billy held Kell back with Billy keeping him away from many good opportunities and interested parties, presumably because the interested parties weren’t interested in Billy Revis? ABC just one major label interested in Kell but not in Revis. Kell finally managed to break from Billy Revis and he finally signed for another major, Mercury but nothing became of this partnership, not one release. This just about sums up Kell’s recording career, impatient and unable to wait for the right deal or material, always thinking the grass greener elsewhere and his close friendship with Bill Revis probably cost Kell a successful recording career, hopping from label to label with little or no success, a sad testament to a mighty fine and unique vocalist. Kell did stay in the business working the circuit, “top of the map to the bottom” until around 1995, at which point he was leading the world famous Drifters working for Hollywood International Talents. Due to the work slowing down and not making the kind of money he once was, Kell at this point decided that he needed a regular and stable income and got out of the music business and took to driving buses. The occasional 45 release did appear. A tiny label called Color-Scheme released Kell (alongside the Perfect Match) and a song entitled “The Women Sho' Is Cold Out Here On The West Coast”. I wasn’t aware of the track whilst Kell was alive and therefore didn’t get the chance to talk to him about this. This wasn’t the last of Kell Osborne though, he has recently (2005) completed and album of new material and Universal was interested in some sort of deal, what becomes of this we shall have to see. Also at the time of writing Arthur Wright was working on a cd of Kell’s 60’s output. This would fail to materialise because of the sad passing of Arthur Wright. Prior to Kell’s death he set up his own label and publishing company in an attempt to kick start his career but this was ended with his passing. The Motown Alumni Association has also contacted Kell in recognition of his part in the early part of the history of the Temptations….if only Kell had stayed with Eddie & Paul in Detroit? Kell had been suffering with his health for sometime. He was due to visit the UK to perform at The Cleethorpes Weekender but had to cancel due to his health and hospitalisation. Sadly, towards the end of January in 2012, Kell was again hospitalised. He suffered further complications and passed on Sunday 29th January 2012. A couple of months prior to his death, Kell’s had set up his own label and publishing company and was looking forward to the future and making music again. Sadly this was not to be. Kell did leave his mark in the world and he was happy to know that his early career was much admired many years later 1000’s of miles away. That’s The Trouble With Love is an 80’s remake of Yaya Yaya (Trouble, Trouble Baby). If anyone can help with any more information on the career of Kell, any other release, dates etc it will be more than welcome. Many many thanks to Kell Osborne himself and to Steve Propes.